“As modern-day adventurers in the resource-rich landscape of Siberia, we feel a deep affinity with the Scythians. They knew what they wanted, and they went out and got it. We’re proud that the warming temperatures resulting from the fossil fuels we extract are helping to unearth these archaeological treasures from the melting permafrost: a welcome upside to the changing climate. “And while archaeologists say they’re in a ‘race against time’ to excavate more Scythian graves before they are destroyed by the thaw, we believe this is a small price to pay while our business remains so profitable. “We love Russia deeply - it is responsible for a third of our oil and gas output. Our hope, in sponsoring this exhibition, is to smooth relationships between Putin and the West and end the economic sanctions that prevent us from drilling in Russia’s Arctic. 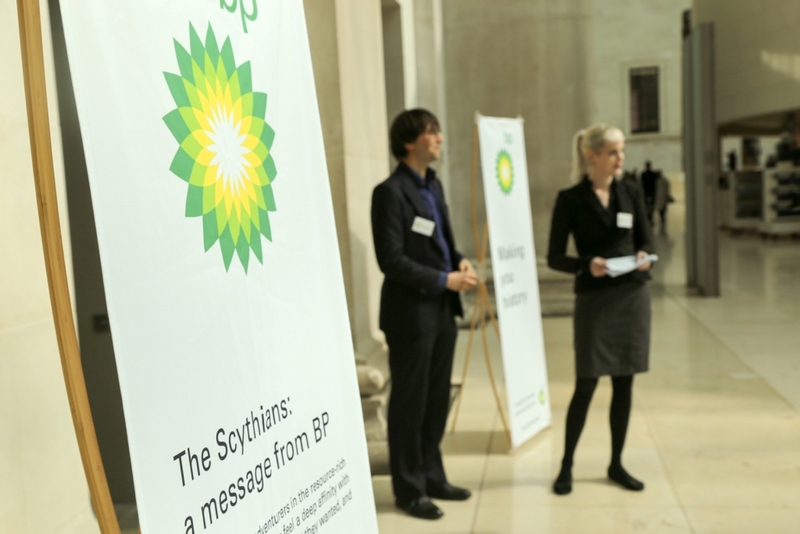 The banners used BP's logo and fonts, and many attendees did not immediately realise the display was a spoof, even though it contained the slogans "BP: Making You History" and "Sponsoring the past, destroying the future". Some people still seemed to believe the display was legitimate, even after the "BP" characters explained that they were only sponsoring this exhibition to clean up their image, distract the world from climate change and lobby for an end to economic sanctions on Russia. Others immediately got the joke, well aware that BP's sponsorship of the museum is highly controversial. The performers – from theatrical action group BP or not BP? – believe that the British Museum is engaging in a form of climate denial by allowing BP to sponsor this specific exhibition, when the future of Scythian archaeology is being directly threatened by climate change. Hundreds of unexcavated Scythian graves in the Altai mountains are under threat from melting permafrost caused by climate change. BP has a long history of sponsoring British Museum exhibitions that further its geopolitical interests. Russia is responsible for a third of BP’s global oil and gas output, primarily through a 20% stake in Russian state oil company Rosneft, but Western economic sanctions targeting the oil industry are hampering the company’s activities in the region, including efforts to drill in the Arctic. BP lobbied against recent US sanctions on Russia in the midst of turmoil around Trump’s ties to Russia. Sponsoring an exhibition in partnership with the Russian State Hermitage Museum provides BP with lobbying and networking opportunities with British and Russian government officials . * The National Portrait Gallery (NPG) received a formal complaint from campaign and research group Culture Unstained, alleging that renewing its BP sponsorship deal contravenes the gallery’s Ethical Sponsorship Policy. * Last Friday, the winner of the NPG’s BP Young Artist Award publicly donated a portion of the prize money to Greenpeace, in protest at the award’s BP branding. * The art critic Jonathan Jones – a previous defender of oil sponsorship – publicly came out against BP arts funding in the Guardian. * BP or not BP? set up a “rebel exhibit” inside the NPG – a portrait of the West Papuan independence leader Benny Wenda – to highlight BP’s role in supporting Indonesia’s brutal occupation of West Papua. * On Sunday, a large group of performers from Fossil Free Culture Netherlands created an “oil-soaked, dried-up, burnt-down forest” inside the Shell-sponsored Van Gogh Museum in Amsterdam, to coincide with an exhibition of nature-themed paintings. The British Museum’s sponsorship deal with BP is already on shaky ground - its trustees were given no say in the highly controversial decision to renew the deal last year. The company only provides around 0.5% of the museum’s budget. After speaking to journalists and visitors for two and a half hours, the performers took down their banners and freely left the space. This is BP or not BP?’s twenty-seventh intervention at the British Museum. BP or not BP? is a member of the Art Not Oil coalition. See here (pdf) for examples of how BP has used previous exhibitions as lobbying opportunities with target governments.